I am V.K. Rishika studying in class IX at St Ann's High School, Tarnaka, Secunderabad. I have been learning dance for the past eight years and I feel very fortunate to be, under the guidance of Guru Smt. 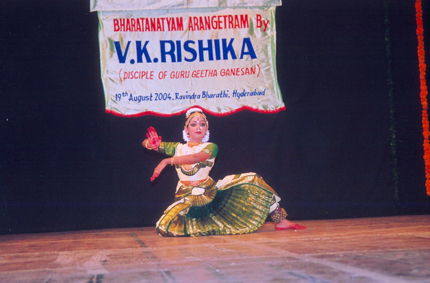 Geetha Ganesan, at Uttaraa Center for Performing Arts. Just like many other students, I also started learning Bharatanatyam for fun. But the very first competition that I participated as a dancer fetched me a first prize and this made me realize the talent in me. The beauty of this expressive art form, the perfection and discipline involved coupled with great dedication from my teacher, helped me pursue this with more seriousness and interest and I went on to complete my arangetram on the19th of August, 2004. I feel very happy and proud to say that this was the first arangetram from Uttaraa. I was blessed by Gertha akka’s Gurus, Guru V.S. Ramamurthy, Smt. Manjula Ramaswamy. The other special invitees who had come to witness and asses my performance were Padmasri Chitra Visweswaran, Dr. Sunil Kothari and Dr. Geetha Reddy, whose words of appreciation and encouragement has brought me a long way. Thereafter, I never looked back and in this period of my training I have been performing both solo and group performances along with Uttaraa troupe at various prestigious venues in Andhra Pradesh, Karnataka and others. I have also won several prizes in competitions such as, AII India Competitions conducted by Navya Nataka Samithi, Andhra Balananda Sangham, etc. My performances have been swept by applause and heart of hearts; I thank my teachers – Geetha akka & Jayaprada akka and my parents, for having exposed me to this medium of expression which has in turn given me an opportunity to experience the joy. Other than dance I am learning carnatic music from Gana Kokila Smt. Prema Ramamurthy. ‘Uttarottara’- as the name itself suggests - we are inheriting these art forms from our seniors & in the process, we are getting to know, see & experience different things in the world of arts. Uttaraa is like bird flying high with two of its wings - Geetha Akka & Jayaprada Akka. I am very proud to be a part of Uttaraa, which showcases the rich culture of Indian tradition.